Posted on December 18th, 2017 . Of all the DIY projects you might tackle during your days as a homeowner, painting a room seems like the easiest. After all, people let their kids do it, right? But painting a room isn’t as simple as picking your favorite color and slapping it on the wall. In fact, there’s plenty of potential for mistakes when you’re painting your home. And while we can’t move your furniture, or stop you from disagreeing with your partner over Raspberry Truffle versus Moroccan Red in the dining room, we can offer some tips to take some of the pain out of painting. A brilliant paint job—free of clumps and unwanted “texture”—starts with getting just the right amount of paint on your brush. This ridiculously simple trick can help: Wrap a rubber band vertically around your paint can so that it bisects the opening, then use that to swipe off the excess paint. They’ve been languishing under your sink long enough—it’s time to put them to work. Alex Levin, another home improvement expert at Handy, suggests another use for the plastic bag: When you need to take a break, just wrap a plastic bag around your brush and secure it with one of the rubber bands you still have on hand. This will keep the paint on your brush from drying out and hardening. If you’ve gone green and have no plastic, use aluminum foil, which will also do the trick as a tray and brush liner. If only paint colors truly smelled like their names. A bite of Vanilla Cookie, anyone? Or perhaps a whiff of Silver Peony? Thanks, but we’ll pass. It’s not paint makers’ fault that the colors we adore are also … noxious. But it turns out, they don’t always have to be. You can avoid the pervasive paint odor by adding your favorite essential oil to the paint can. Judi Kieffer, president of Kieffer Design Group, recommends 1 teaspoon per gallon of paint or one 15-milliliter bottle for a 5-gallon bucket. The odor won’t linger, so you can use your favorite smells or consider matching them to the vibe you’d like the room to have (e.g., citrus oil for energy, lavender oil for peace and serenity). 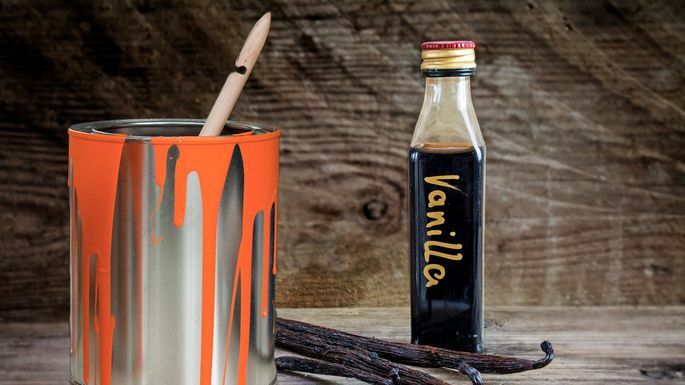 If you’re more baker than bohemian, vanilla extract will also do the job. “Many times 1 gallon can vary ever so slightly with the other, and no one wants a wall to show streaks or shade variation,” Kieffer says. Once you’ve used about two-thirds of one can, blend it with your next can to create a more even tone. This way you won’t spend the next year squinting at your walls, wondering if that slight color change is really there. It might seem hard to believe when all your walls are stark white and bare, but there are some parts of your house that just don’t need to be painted. But you don’t have to invest in rolls and rolls of painter’s tape to avoid drip stains. Simply wrap your doorknobs and other fixtures in tin foil. It will wrap more closely and accurately, without needing adhesive. For those fixtures that tinfoil just can’t cover, you can use petroleum jelly. You can even use Post-It notes if you’re deep into your project and can’t make a supply run, but be careful of movement around the edges. If you’d still rather use tape, accurate application is key. You might not already have these lurking in your storage bins, but canvas dropcloths are worth the investment. “Plastic dropcloths might be cheaper, but they aren’t worth a dime when they come up under your feet, making you feel secure until you find the drops of paint on your carpet later,” Wheeler says. Canvas dropcloths are better because the canvas will also absorb paint, bend around corners, and avoid becoming slippery, Gesuelli says. “It’s reusable and reliable—which is what you want,” Wheeler adds. Did you forget to wrap your brush with that plastic bag when you took a break? If so, you might have come back a few hours (or days) later to a crusty, hard mess. Don’t throw away those brushes just yet. Just combine 2 tablespoons of fabric softener with warm water, and then soak your brushes in the mixture overnight, Wheeler says. A good scrub the next day should make your brushes as good as new.